Activity Holidays - with a difference! Our unique Cultural Activity Holidays combine the best bits of a bus, cycling, walking and cultural tour, all in one great trip! 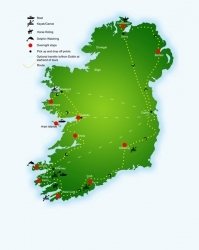 We take you out into the great outdoors, on leisurely walks and bike-rides each day, so you can truly experience Ireland’s spectacular scenery, its stunning National Parks, and its unique cultural sites. Travelling in small groups, we get off-the-beaten track and take you to some of the most un-spoilt, spectacular corners of Ireland, where culture and tradition are deeply entwined. On our Cultural Activity Holidays, you’ll enjoy a ‘touch of comfort’, as we typically stay in genuine Irish character hotels in private, en-suite rooms. See our choice of inspirational holidays, below, where you can choose a duration to suit your timescale, from a short weekend break to the ultimate 13-day tour of Ireland. Experience the 'Real Ireland' as you discover quaint rural villages, colourful market towns and vibrant cities on this fun packed, 10-day tour of Ireland. This epic journey will take us from the wild west of Ireland, all along the breath-taking southern coast, to the dizzy heights of Northern Ireland.